Some locals felt these were “sweeter’ than prawns, while others described them as having a “stronger flavor”. Crawfish would be delicious steamed with some lemon butter sauce, or even included in a seafood paella. I wish they were more abundant and available even in Manila… If you are from the surrounding provinces like Negros, Leyte, etc., do you know if these crayfish also thrive in your area? Please leave a comment if they do. Thanks. I’m from Australia and they look alot like what we call yabbies or freshwater crayfish.. some of my best memories are going down to the local creek/lake on a hot summers day with a couple of nets and chicken bones and catching these delicious things! They are very much like sweet prawns. This is something new for me…Interesting.. I live in Sorsogon and I have seen crawfish in Prieto-Diaz, a municipality here. It’s known locally as ananakla. The taste is indeed sweeter than shrimps and much more aligue too. On the other hand, shrimps taste brinier. The aligue is found on the head and in cases of fat ananakla, is a vivid shade of orange. Try cooking this in chili-garlic sauce. Sarap! We call these crawfish in the US, they are abundant in Louisina and they are often boiled with potatoes, corn, spices, etc. It was being sold to us before as baby lobsters. but at the “cheap” price of shrimp. go figure :P but after trying it, I realized that I am allergic to it. or maybe cuz it was the first time i tried it. funny though. in kapampangan (my mom is from tarlac), takla means poop. I remember flipping through tv channels some years back and I came upon a local agriculture show with a segment on crayfish farming. so I guess crayfish have been farmed locally for quite some time now. Aha! I was wondering when you were going to feature these babies. Lots of these here in Leyte. Be careful when handling them because they can be snappish and make good use of those pincers. For the non-Bisayas, they’re called takla because of the clucking noise they make. Delicious plain sauteed in a bit of oil, with ginger juice, kalamansi, salt and black pepper. Their shells are a bit tougher compared to shrimps’. i had a basinful of these in Marinduque a long time ago, where they	are called “manakla” (“takla” sounds….uhmmm..totally unedible :-( …..i think i had one too many because i remember having severe abdominal cramps that night. those in you pics look like fat ones. wait, would they be related to “alupihang-dagat”? i think those are called yabbies, too. they used to have large, succulent ones in tawi-tawi which the locals call “kamun”. wow wow wow wow!!! i’m so excited to see that we have these locally!!! backyard crawfish boil coming up! artisan chocolatier, whaddya think? They are distantly related being both crustaceans but not quite kissing cousins since alupihang dagat are stomatopods caught in salt water and these look just like French Ã©crevisses which thrive in fresh water. They are called ulang in Tagalog. A friend from Laguna once brought us a pot of them cooked in coconut milk (as most special dishes there) until the liquid ran down and the crayfish slicked up and glistened. Que rico. I had my first taste of pan-fried takla 10 years ago in the town where it is most abundant–Calape. Takla factoid 101: fishermen in Calape use tobacco butts and ash as bait for ‘takla’ and make the ‘takla sound’ (you know what I mean? So the name ‘takla’) whilst they fish to attract the ‘takla’ near mangroves. (The detailed catching procedures escape me now). The town’s street vendors sell them strung together in a ‘sako’ string, much like the one in your photo. I’ve tasted a variety of prawns, lobsters and what-not but, by far, takla still has the smashing taste for me. Indeed, sweeter and tastier than prawns! Here in Vietnam there’s really no crayfish but they sometime repackage the crayfish from China and labeled it as made in Vietnam. 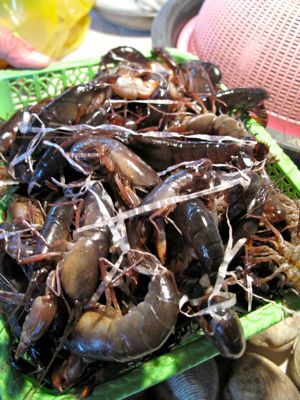 Though they have tiger prawns whom they often mistaken for crayfish but they are not. But one thing is for sure… Australia has a large crayfish fauna. @wahini…..I’m allergic to crustaceans, but I’m willing to try some…should be good with a bottle of ice-cold beer!! The veranda at Casa Escano would be a perfect setting! nkatalikod atleast ngaun lam ko na how u look like..ang saya saya really wen i saw u on travel and i was like shouting thats him like i knew you personally.. hehehe personal n rin cguro un kung araw araw mong binabasa blog ng tao db?its sort of a habit na nga eh.. yun lang hehehe..kaw nga ba yun? hejehe naniniguro lang bka mali..hehejehe…keep on writing…god bless…. Whenever we go down south, especially early spring, I’m always on the lookout for crawfish/crayfish Cajun style boil using freshwater crawfish from Louisiana mainly. I love digging into a pail/bucket-full of these! Dipping the sweet tail-meat into drawn butter/lemon dip & sucking the fatty heads clean! Vietnamese immigrants to the Gulf area have taken on this southern signature dish & spreading the joy of eating this delicacy – Asian version, not just	in the Louisiana-Texas area but all along both Western & Eastern seaboards as well and venturing into the midland states. I grew up in Olongapo City and these or a close relative thereof was called “atla” was a favorite delicacy of my mother’s. She got up in the wee hours (3 am-ish) to meet the fisher-folk in Subic who caught them as I don’t believe they ever made it to the market. Off topic : Hope all you guys holding stocks have shifted to Cash. Since I am in the Executive Committee for Investment for our Company in Global Stocks, I keep a track of all factors affecting our Holdings. Market conditions as well as Technical Analysis. I made a recommendation a week ago TO SELL before the actual selloff and now we are laughing our way to the bank. We have also picked up many stocks in our Core Portfolio at 10-25% cheaper than at their Year High. I too am an advocate of Long Term Defensive Investing, but if we can make an informed judgement, and increase our Bank Balance, then ofcourse our Bonuses will be bigger. Bottom line being Cash in the Bank. 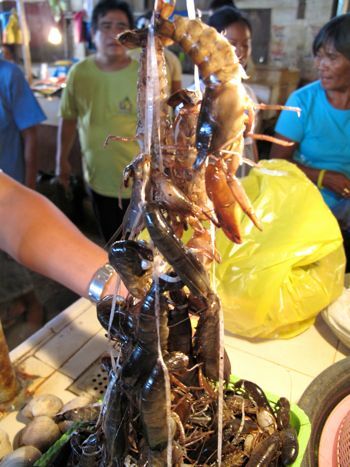 I come from Iloilo and I have seen crayfish in my hometown but only very rarely…. Happy golden anniversary to Silly Lolo. I trust the renewal of vows and subsequent honeymoon did not permanently put you out of commission. Hoping to hear from you soon (and this applies to BettyQ too). my great grandmother loved these!!! she would cut them open at the back, put them in a big bowl, pound lots of garlic, ginger, black pepper and just sprinkle them on cleaned, raw crayfish shake them vigorously after salting them. they sit for about 15 to 30 minutes, then she eats them raw. said they were sweet!!!! i remember her eating these with steamed rice. The newest restaurant trend here in Silicon Valley are crayfish restaurants. Many are owned by the Vietnamese community and offer the Cajun preparation which people are familiar with and ‘Asian’ preparations as well. Matter of fact, you can pretty much travel the world on your tastebuds in Silicon Valley. Good jobs maybe scarce, but at least you can eat (on a budget). I love crayfish! They’re good esp if they have aligue. We call them alupihan, but the ones my mom buy in Malolos look a bit different from the crayfish you spotted in Bohol. But I’m not sure..
They’ve been disappearing actually. They haven’t been available in the wet market in Malolos for a few years already, until they reappeared last weekend. =D They are in season Jun-July, I heard. I used to work for a company that assigned me to work in Louisiana for several months and crayfish is a delicacy there and served boiled in large heaping baskets that you are expected to consume in one sitting. Most of my co-workers just loved eating these little creatures. For some odd reason ( I am a very adventurous eater and will try most anything )	I couldn’t get myself to try them. I kept thinking Termites. MM with your recent posts on Bohol makes me homesick. speaking of crawfish from Louisiana, was in New Orleans a couple weeks ago for work and got to try crawfish etouffee (eh-too-fey) for the first time. it was soooo good!!! would highly recommend it to you MM! As Artist Chef Vietnam posted, Australia has a wdie variety of crayfizh.crawfish.yabbie. Mostly these are freshwater species found in freshwater river, creeks, dams, and freshwater impoundmnets. THere are also several aquaculture businesses growing different species of these, mainly for export markets , but a growing domestic market . Some species are protected here in Australia, and some can grow over 12 inches ( 300mm) in length. The red claw variety are numerous in certain areas. Delicious to eat and a simple way to cook is to just boil them whole. My parents did brought home 2kg of takla yesterday. They ordered it directly from the fisherman at 250 pesos/kg, though they were way far smaller than your picture. I cooked it hinalabos-style for our dinner. They were more sweeter and malinam-nam than shrimps or prawns. Hi, I’m a filipino and I live in the cajun world right now, in Louisiana USA. people here raise crawfish and almost everybody raise and eat them. they catch crawfish from december to June the next year. anf if you wanna eat crawfish with the right ingredients, come and visit us, you’ll never forget the taste once you try it. we put crawfish boil, crawfish oil, garlic and bay leaves, we have the best food in the world here. God bless y’all. I’m from iloilo now living in australia. i have few fresh water blue lobsters (crayfish) in my aquariums. i have few more pairs of red claw crayfish coming 2 weeks from now. these things grow super fast and can reach up to about 500grams in just a year if you feed it right. here in australia they are a delicacy and not so cheap too. you’re looking at about $AU 25-35 a kilo of these (P975.00 minimum) definitely a sometime food for me, i’d rather buy galunggong instead, but don’t get me wrong because tastewise naman ay talagang napakasarap no matter how you cook the thingy. so when i’ve learned from here that it’s only 100-300 pesos there in pthe philippines, that’s so cheap i’d better buy a lot when i come back home….! its sounds “Funny:” to the kampampangan…because “takla” means poop…but they are delicious..
yes we have takla here in negros oriental. you can see it it dumaguete city near in the port area. they use it as a pa in for fishing. I am from New Orleans in Louisiana and we eat crawfish in Louisiana. They are a staple of the Cajun people’s diet from Southwest Louisiana. I am happy to know that they are available because I would love to have a Crawfish Boil in the Phils. I am in New Orleans today but returning to the PI on Friday. I will stock my luggage with the spice packages for boiling crawfish (see crab boil at zatarains.com). In addition to the spices we add fresh corn on the cob, small potatos, large garlic and lemons to the boil. We generally boil them in batches of 15 to 20 kilograms and the average person will eat about 2 kg. The Cajun culture is very similar to the PI culture with their love a good party with lots of food and beer. My name is SAM from indonesia. I will ready to sell my crayfish on 1 year next. Please contact me to unquiry at: samijan@baramultigroup.co.id or samijan_11@yahoo.com. 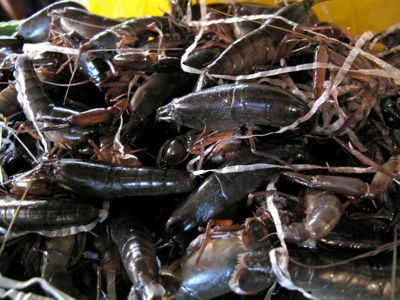 Very similar to crayfish, crawdads or crawfish found all over the world. Extremely popular in Southern USA but also in the Northwest USA. Jake’s Famous Crawfish is a popular restaurant in Portland Oregon over 100 years old that features them in both their name and menu. And the Tualatin Crawfish Festival just south of Portland is an annual event. There are so many good recipes that can feature or include crayfish, put paella is a natural. Since crayfish are natural scavengers, commercial outfits that caught them would often keep them in underwater cages for a few days before selling, feeding them green matter (like lettuce) to allow them to clean their digestive system. I used to catch them while scuba diving, swimming along a lake bottom with a net bag and just scooping them up. Again, in Oregon USA. Is this another case of plagiarism? Or just sloppy, lazy journalism?? Marketman on Jessica Soho’s “Kapuso Mo” (Again) This Saturday (Jan. 15) at 8:30p.m. !